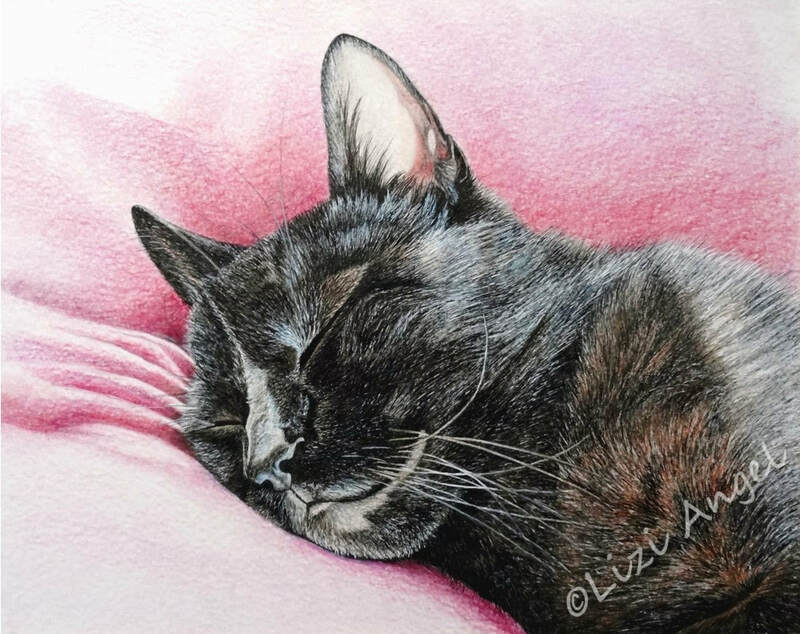 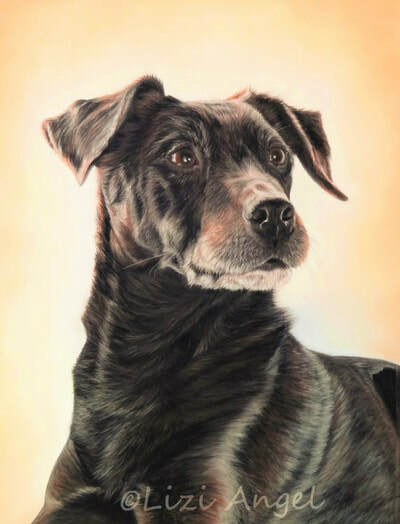 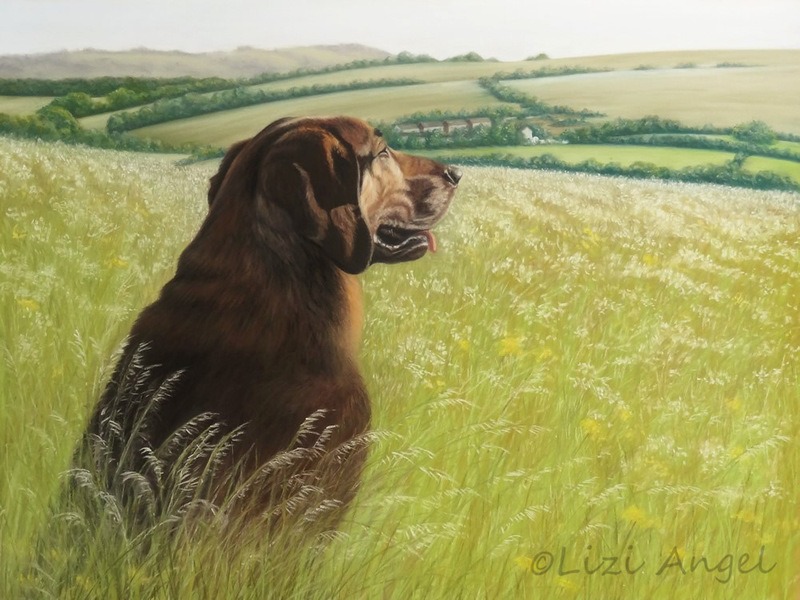 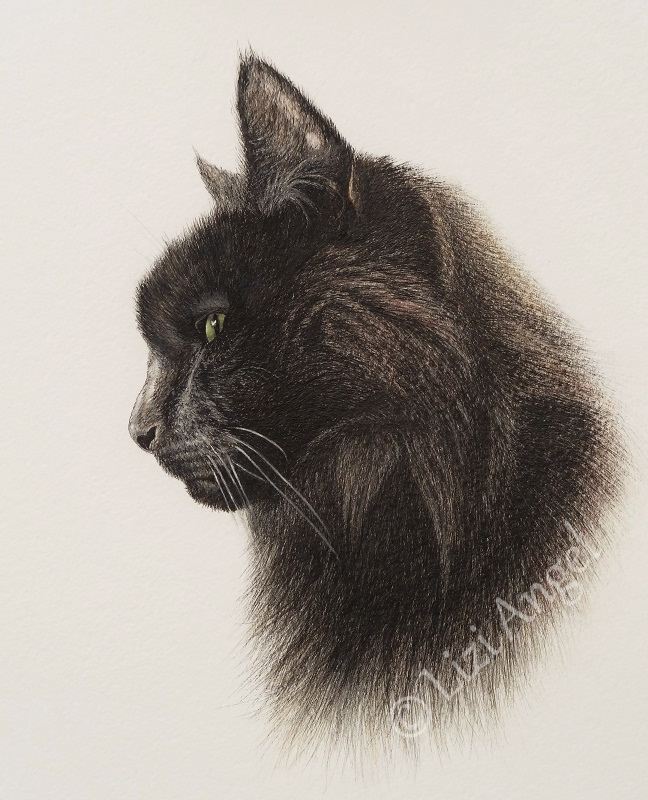 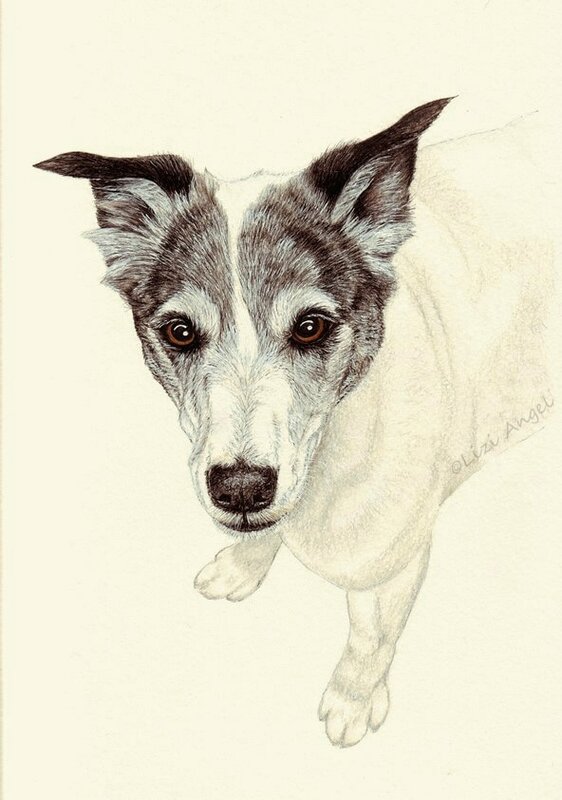 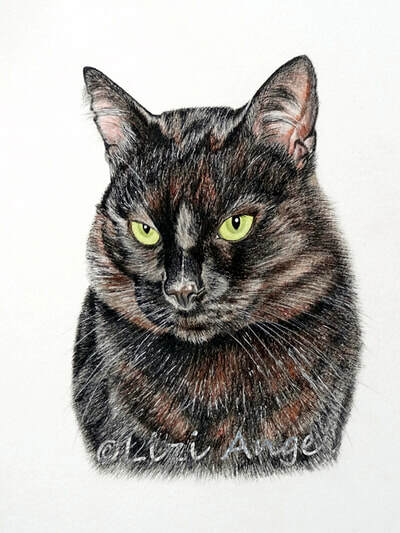 There is something very special about a painting of a beloved pet, something that a photograph cannot capture - even just a few skillfully drawn lines can speak volumes of a pet's individual character. As a life-long pet owner myself, it's important to me to not only produce a perfect likeness of an animal, but to capture more than just the physical. 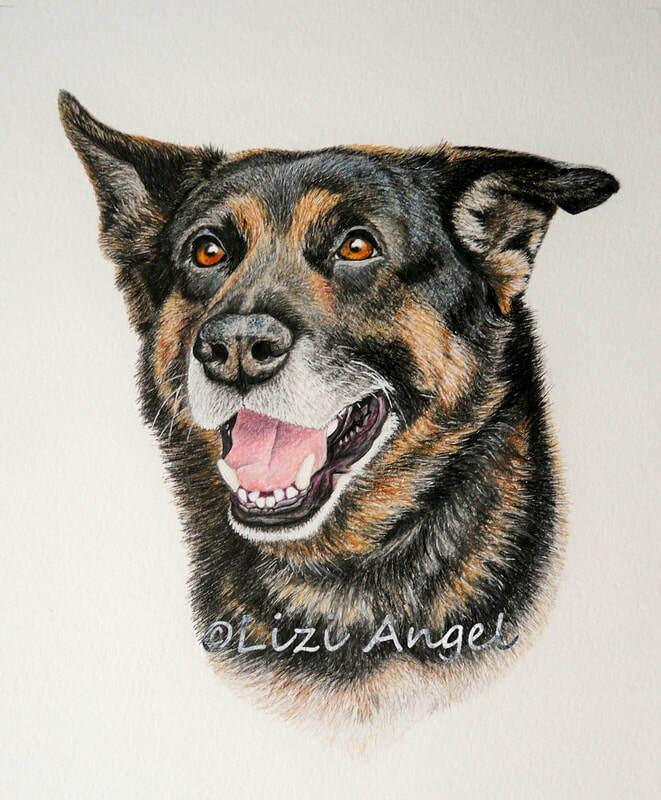 I aim to create portraits that capture body and soul, that owners will love and treasure, and be reminded of happy times together. I take a very limited number of private commissions a year, so if you would like me to create a portrait of your pet, please get in touch via the form on the contact page so that your message comes straight through to my email inbox, and we can discuss price according to your requirements. 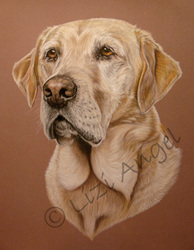 Please also see Pet portrait FAQs for further information. 10% to pet rescue charities. 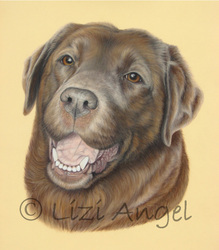 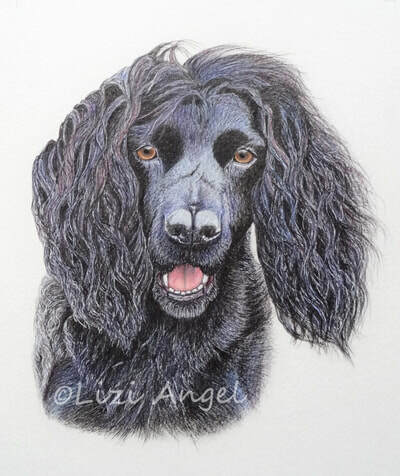 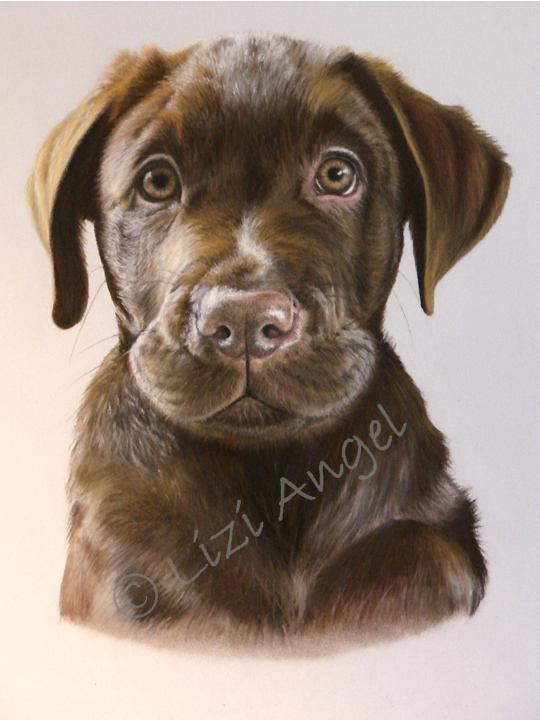 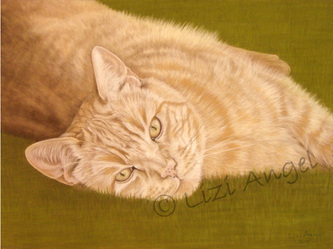 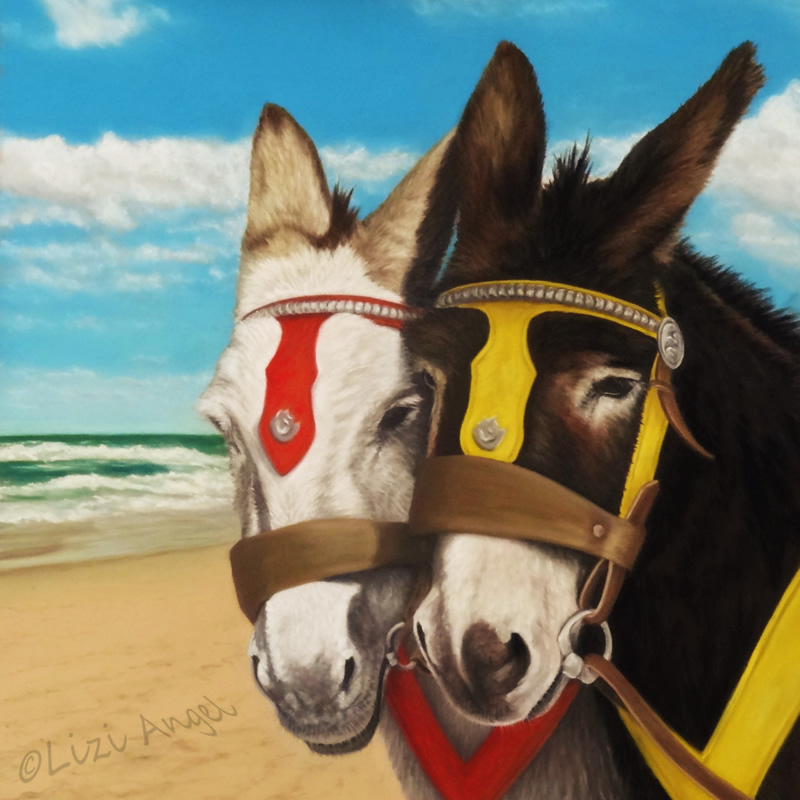 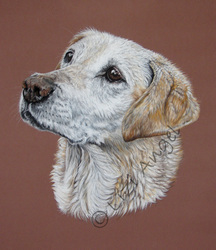 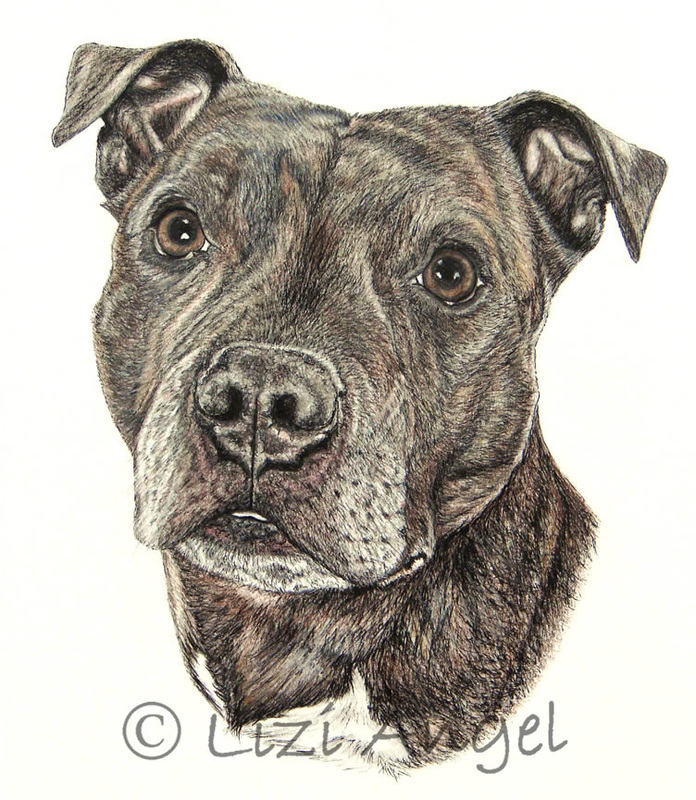 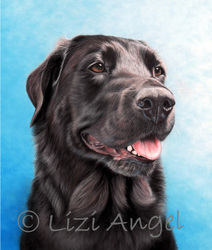 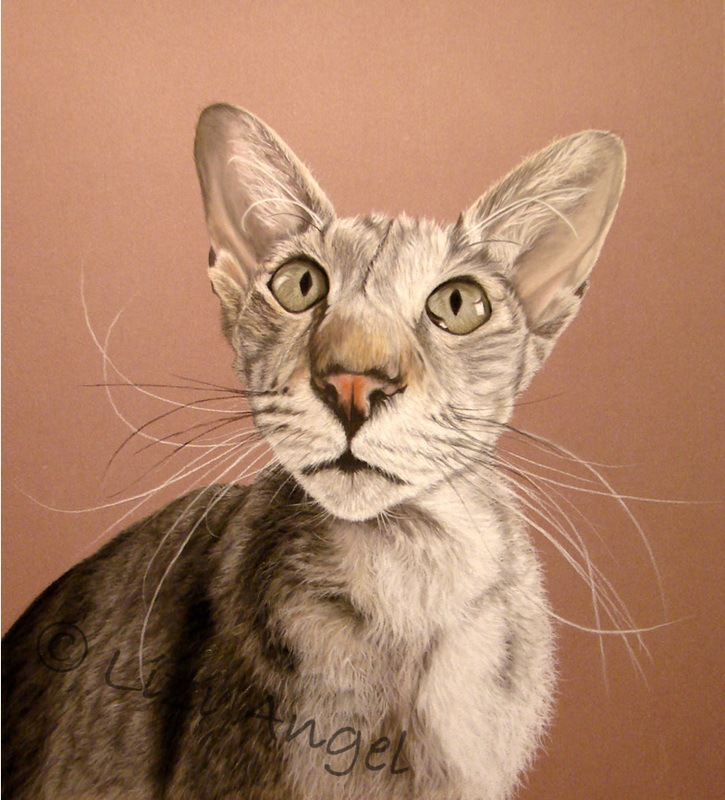 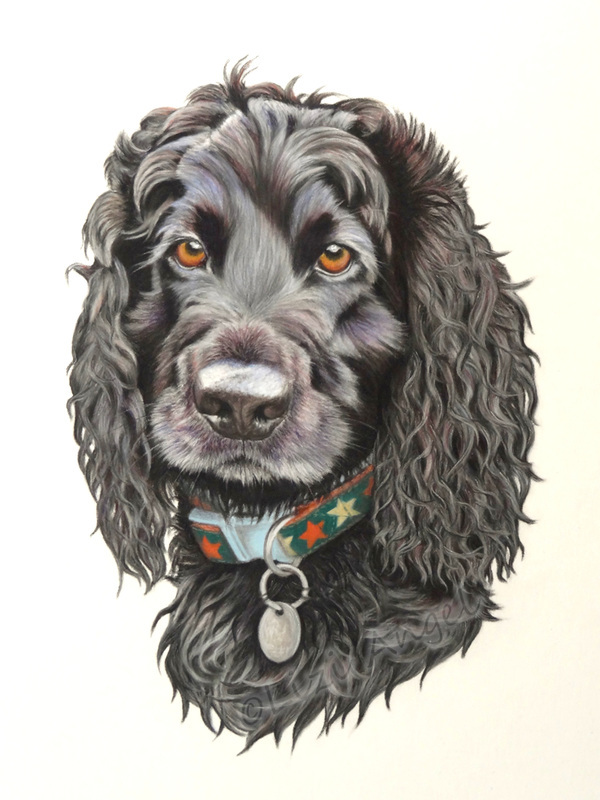 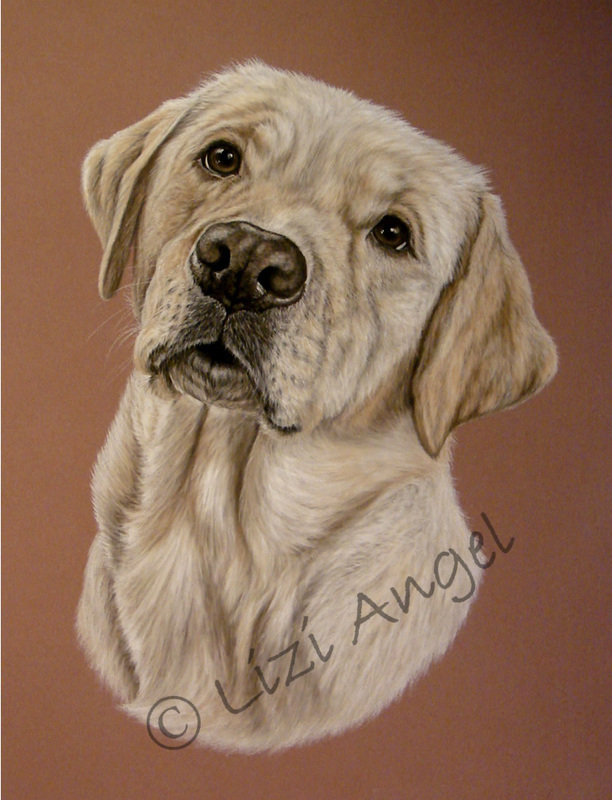 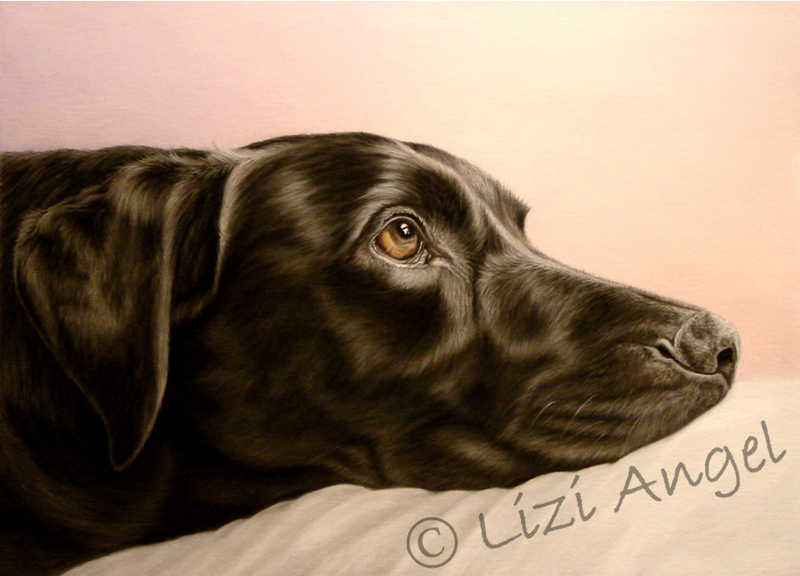 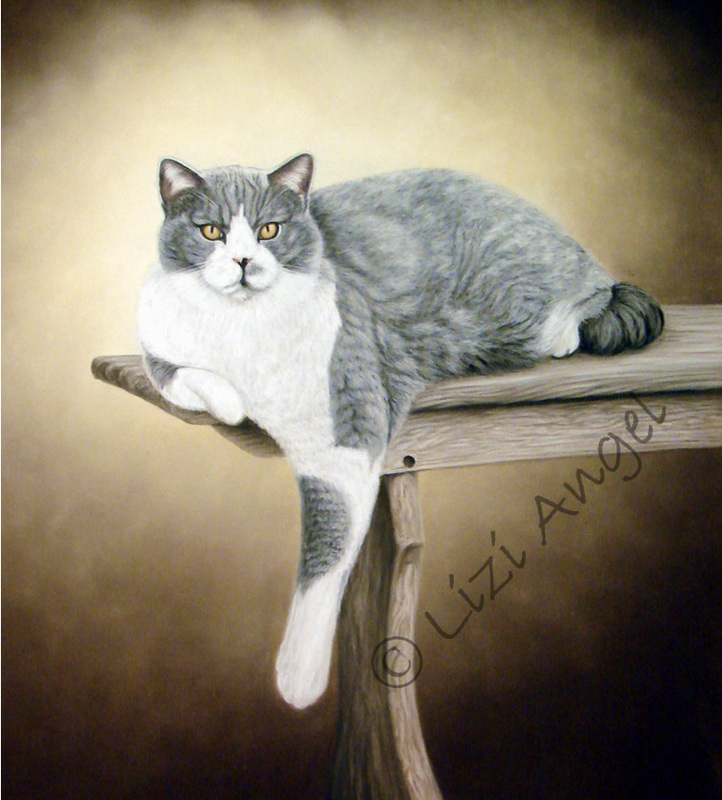 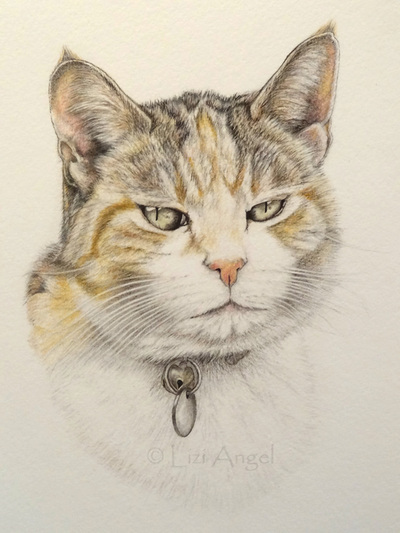 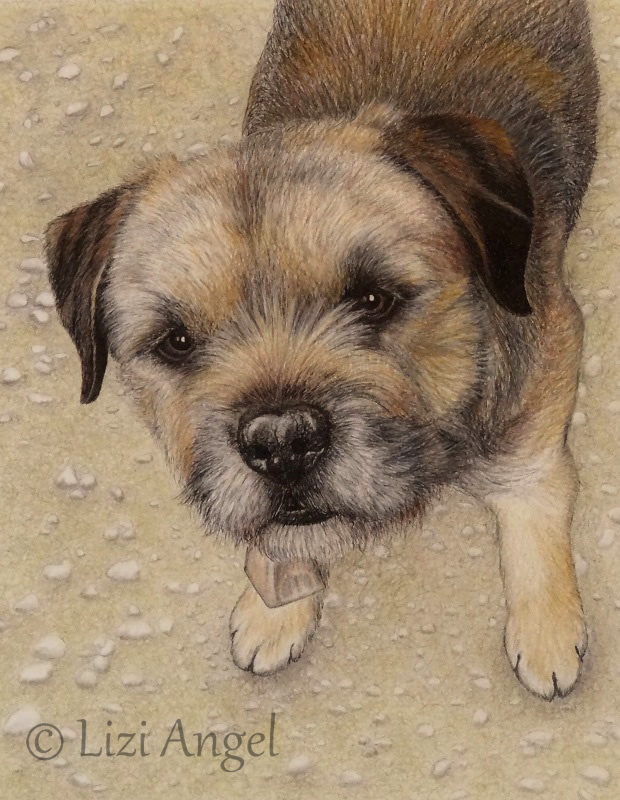 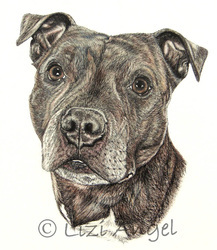 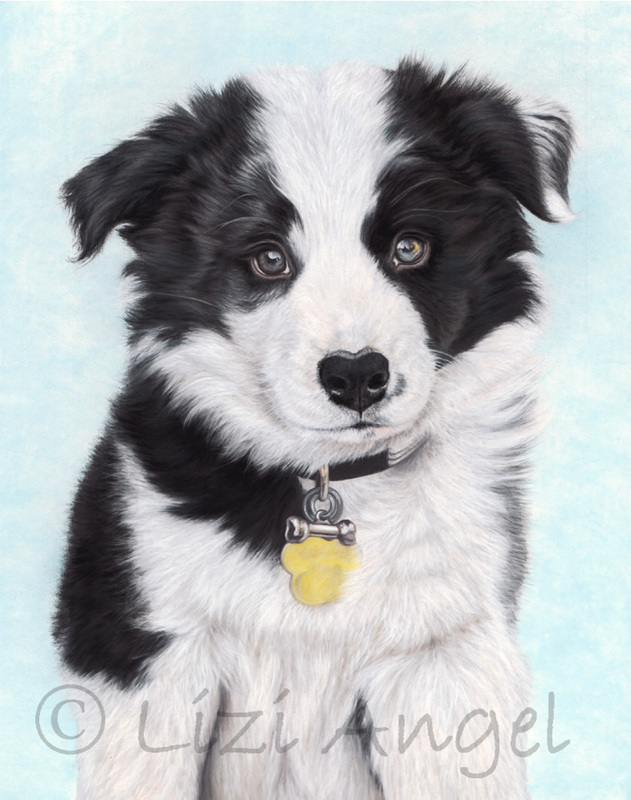 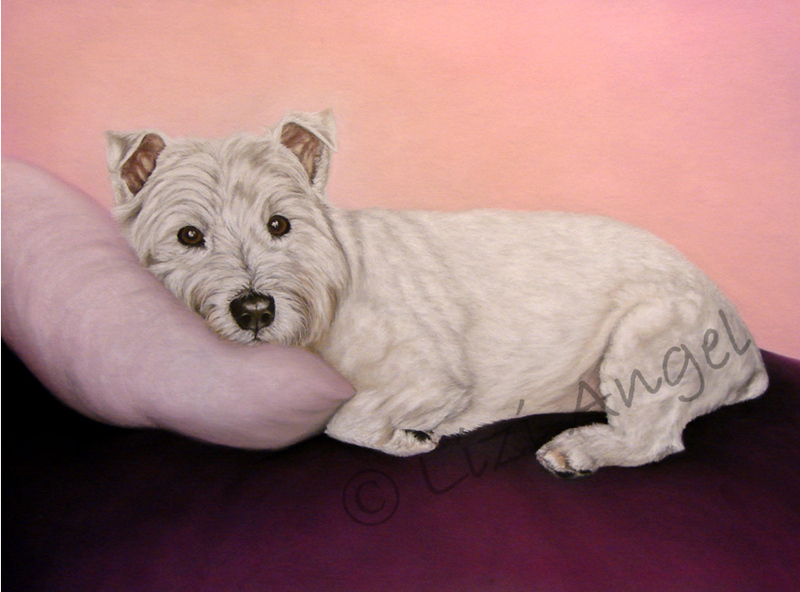 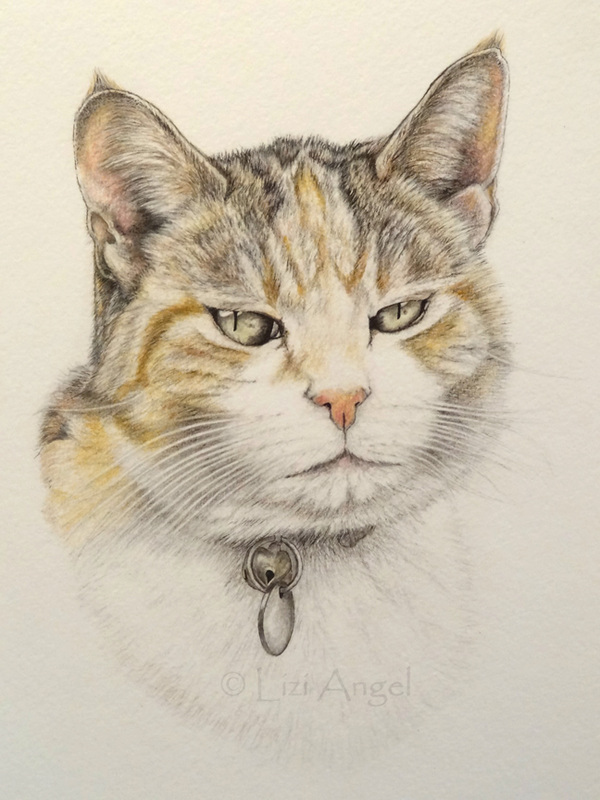 I donate 10% from each pastel portrait commission to pet rescue and rehoming charities. 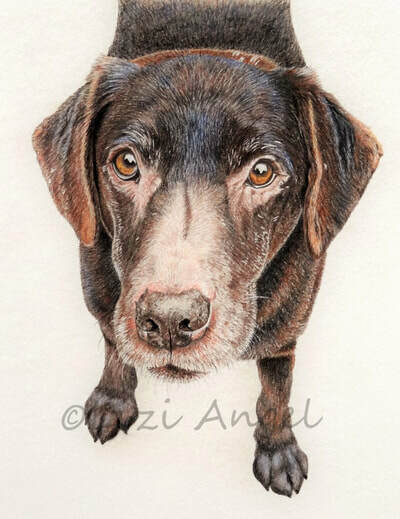 Clients receive a 'thank you' voucher from me, like the example below, with their portrait. Each voucher has its own charity reference code so that my donations are traceable. Clients have a choice as to which charity I donate to from those that have subscribed to my 10% fundraiser. 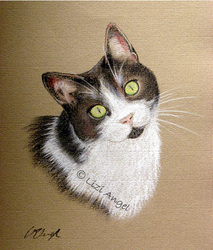 If you are a small pet rescue charity and would like to included, please contact me for details. Ink and coloured pencil on 300 gsm cold pressed, textured paper. 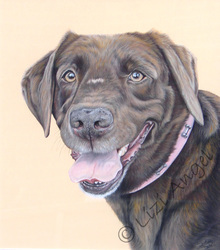 A unique and affordable gift for the doting pet owner in your life! 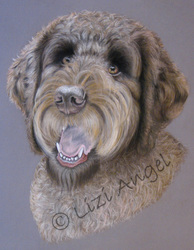 For multiple subjects and backgrounds, or if you would like me to frame your sketchy, please contact me for a quote. 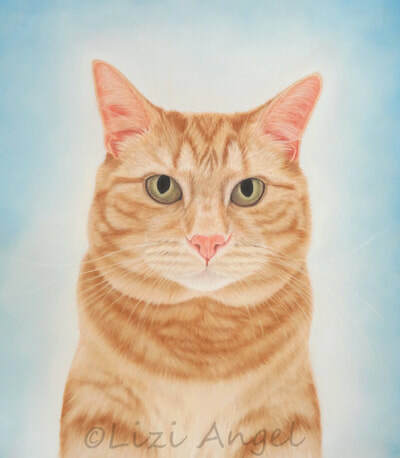 I work from photos. 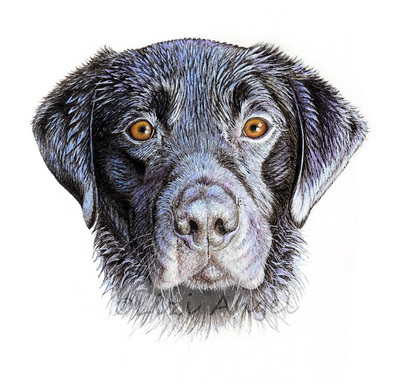 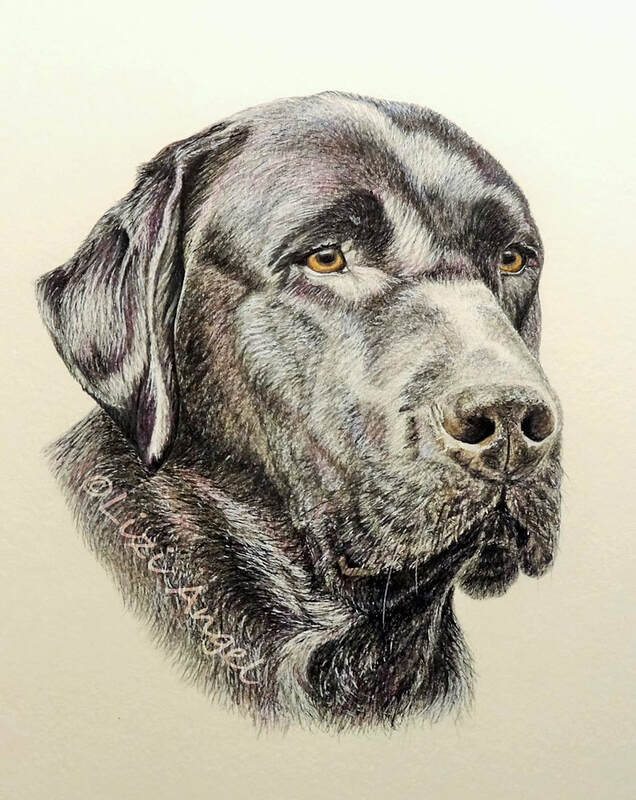 I can only sketch what I see, and if your photos don't show your pet's face clearly enough, I won't be able to produce a detailed sketch from them. So ... 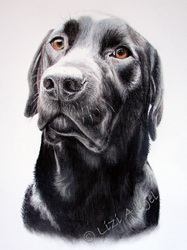 I will need one 'main pose' photo of your pet's head and neck from which I will work most closely, and several others for colour and detail reference are always helpful. 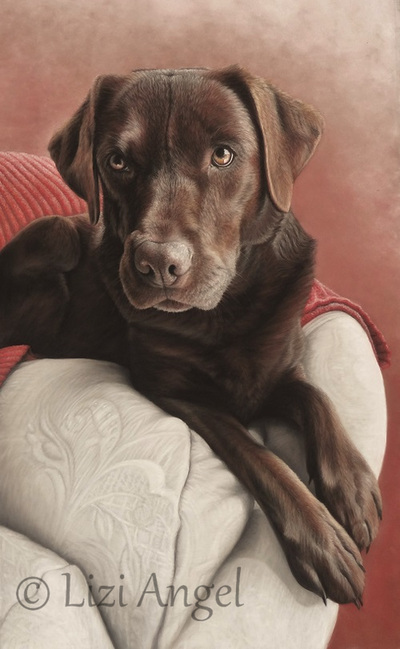 The 'main pose' photo needs to be sharply focused, taken in natural light (but not bright sun), and of a high enough resolution/file size to show a good level of detail at full screen size. 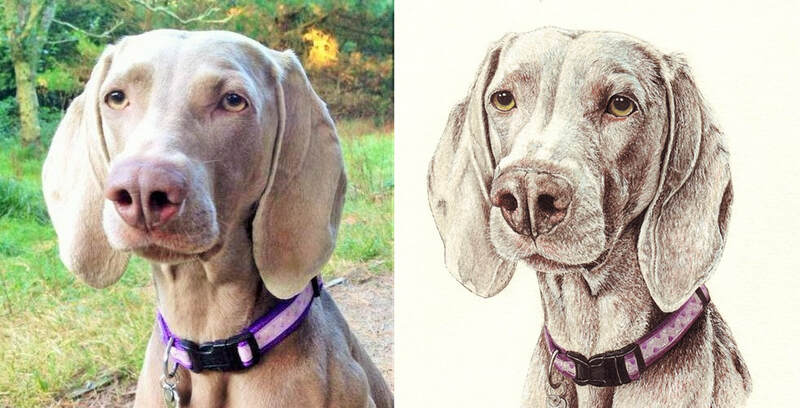 The following 3 photos are ideal 'main pose' shots, and hopefully the photo/sketch comparison beneath them shows why the quality and attributes of the 'main pose' photo are so important, because the sketch will closely resemble the photo. 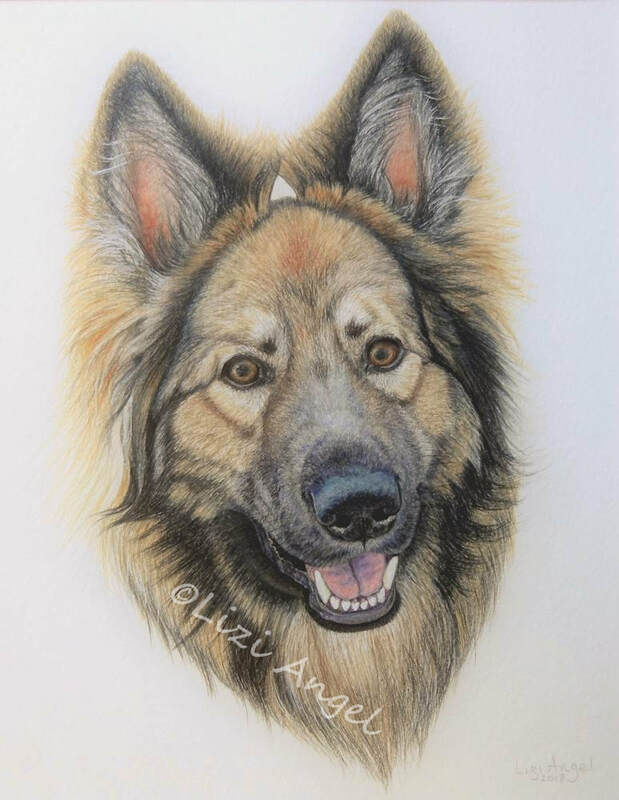 Ink & coloured pencil sketch of a young German Shepherd Dog, which fetched £30 in GSDR North's Christmas 2018 auction on facebook. The competition raised a fantastic £106.00 (minus JustGiving's processing fees) for Many Tears Animal Rescue! 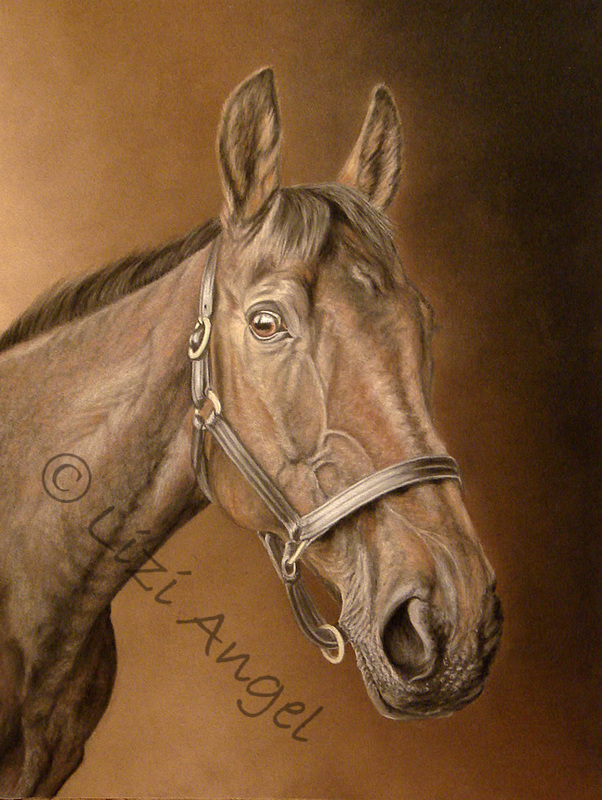 Pictured left, the winner's sketchy of Benson. 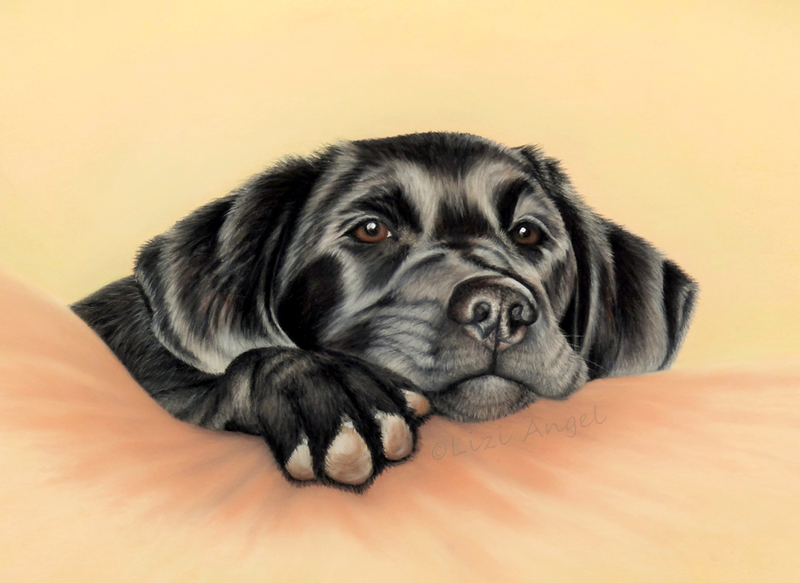 Many Tears Animal Rescue (MTAR) rescues and rehomes primarily ex-breeding dogs, many of whom have endured extremely harsh living conditions. 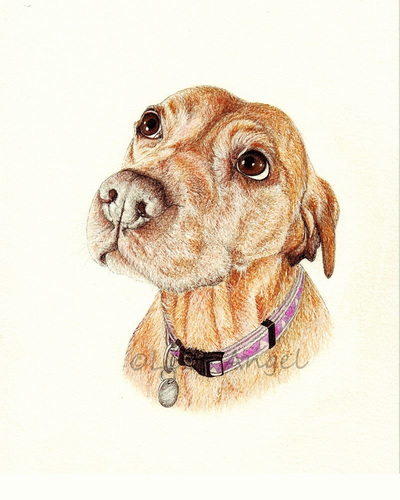 Very often these dogs are suffering with a wide range of long-standing health problems, from chronic skin conditions and ear infections, to rotten teeth and mammary tumours. 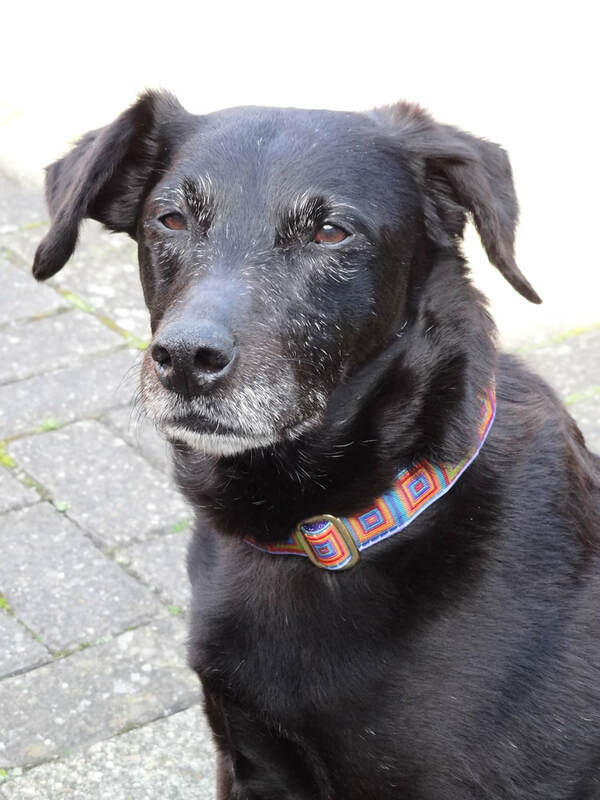 MTAR rely heavily on public donations to fund the veterinary treatment that so many of these dogs urgently require to return them to good health, and give them a second chance at life as a pet in a loving home. 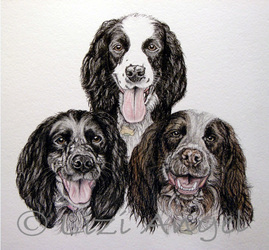 My 4 auction lots raised a fantastic total of £114.00 for the Sussex Badger Vaccination Project! The competition raised a fantastic £120.50 for Gables Farm Dogs' & Cats' Home! 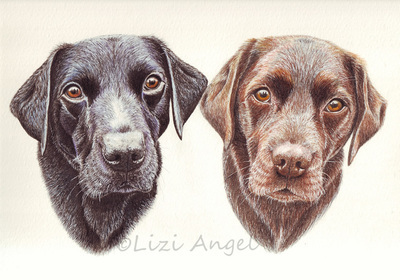 Pictured left, the two winners' sketchies of Roxy & Beau. 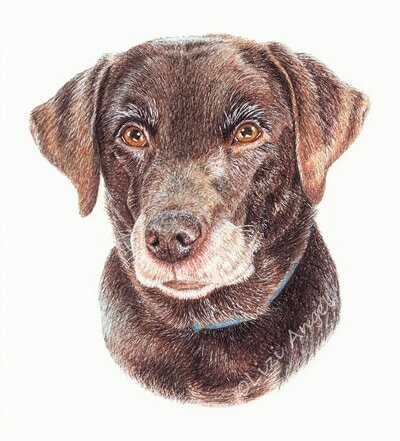 The sketchy raised £50 for LRRSE. LRRSE (Labrador Retriever Rescue Southern England) is a registered charity (1105955) that rehomes purebred and Labrador Retriever crosses. 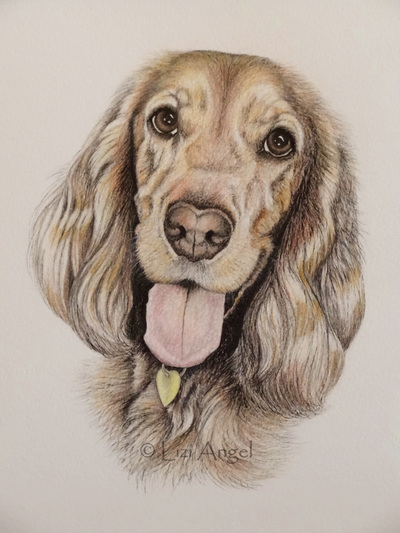 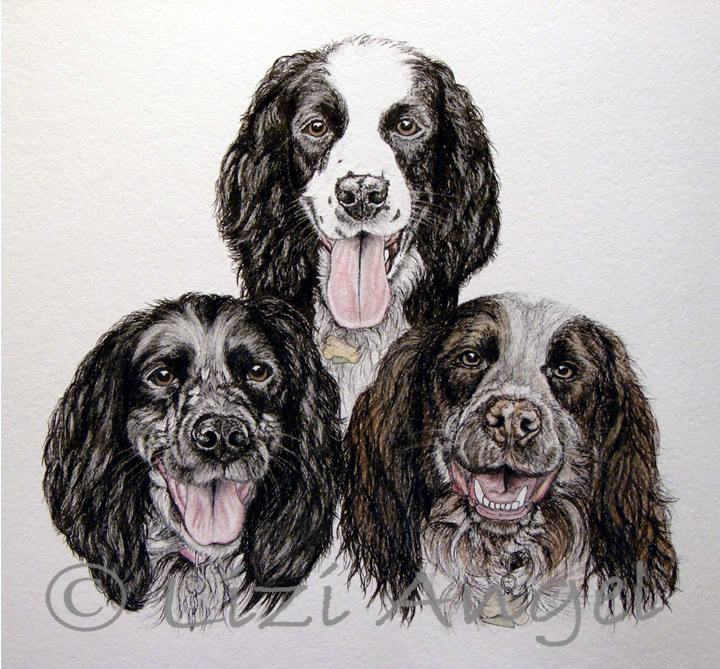 The picture left is the winning bidder's sketchy of her spaniel, Molly ~ what an adorable face! 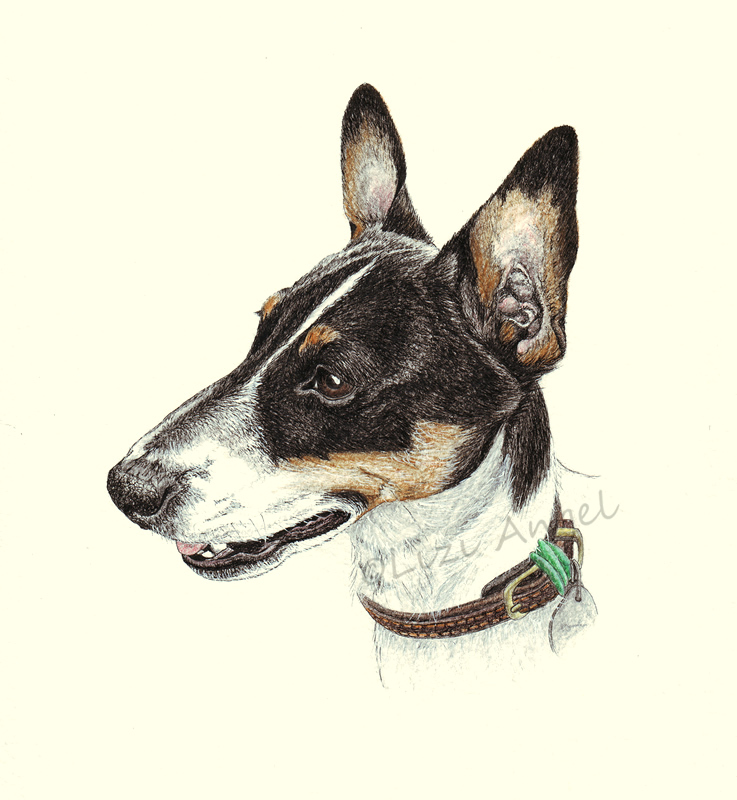 The sketchy raised £50 for GRWE. 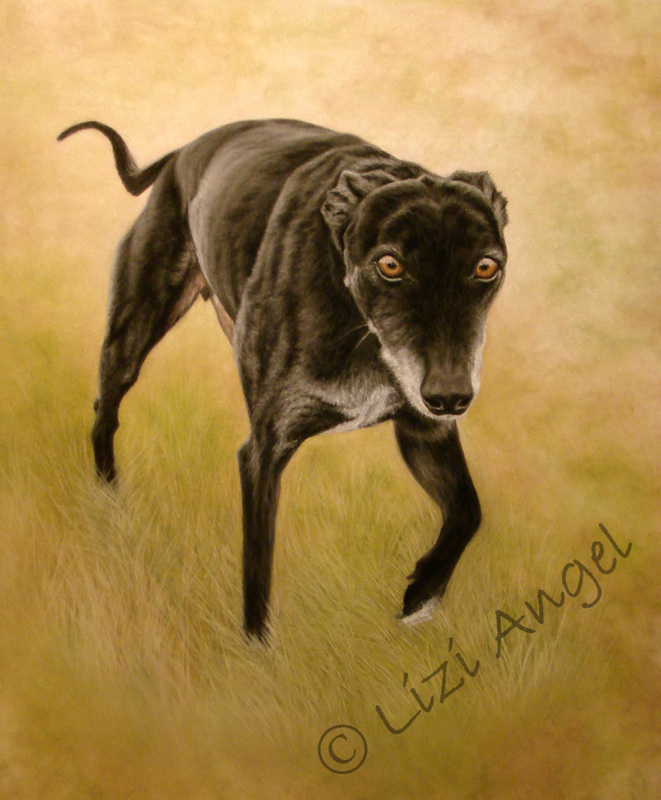 GRWE is the leading greyhound rescue charity in England and Wales independent of the greyhound racing industry, and is dedicated to the rescue, rehabilitation and rehoming of abused and abandoned greyhounds and lurchers. 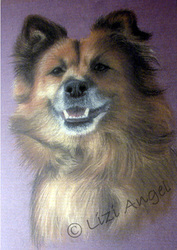 GRWE is a registered charity (Registered Charity No. 1131399). 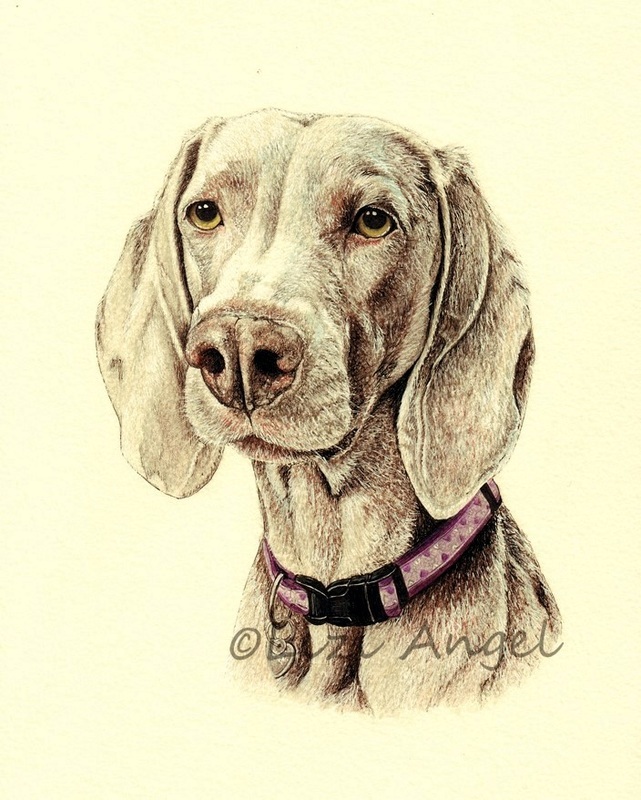 Visit GRWE's website to find out more about the wonderful work they do for these beautiful dogs. The picture left will be updated with the winning bidder's sketchy soon. 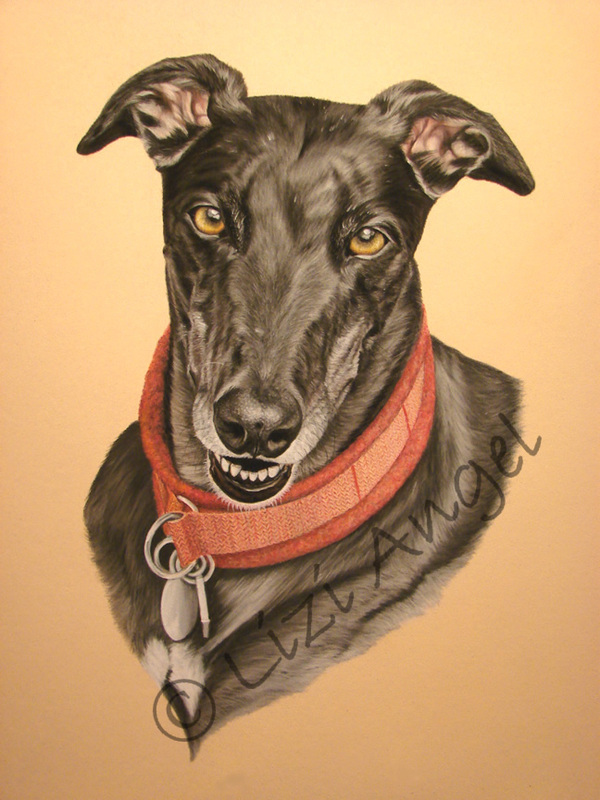 The portrait fetched a very respectable £185, with £115 going directly to GRWE. 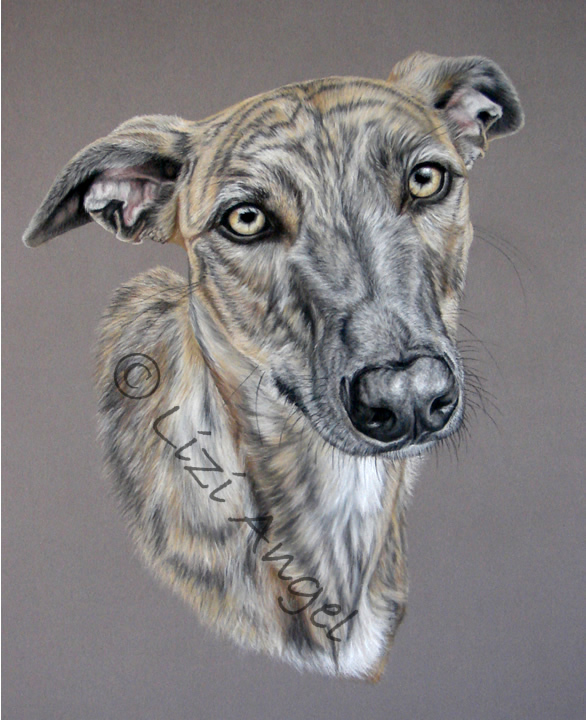 GRWE is the leading greyhound rescue charity in England and Wales independent of the greyhound racing industry, and is dedicated to the rescue, rehabilitation and rehoming of abused and abandoned greyhounds and lurchers. 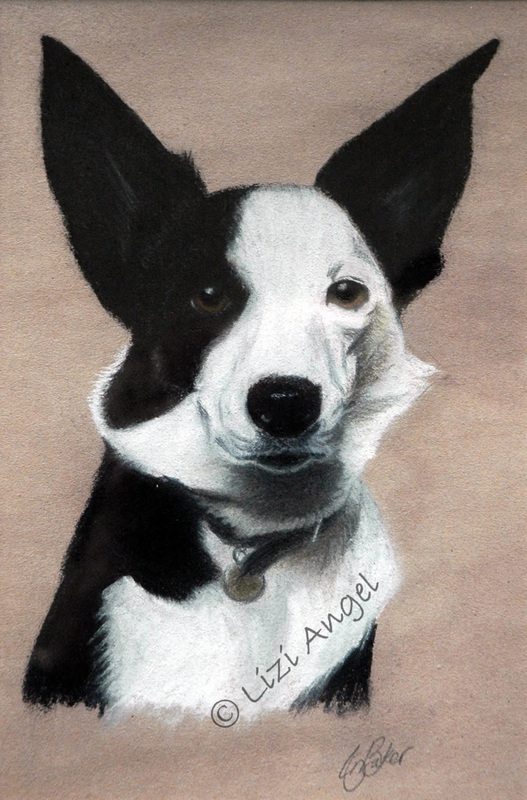 GRWE is a registered charity (Registered Charity No. 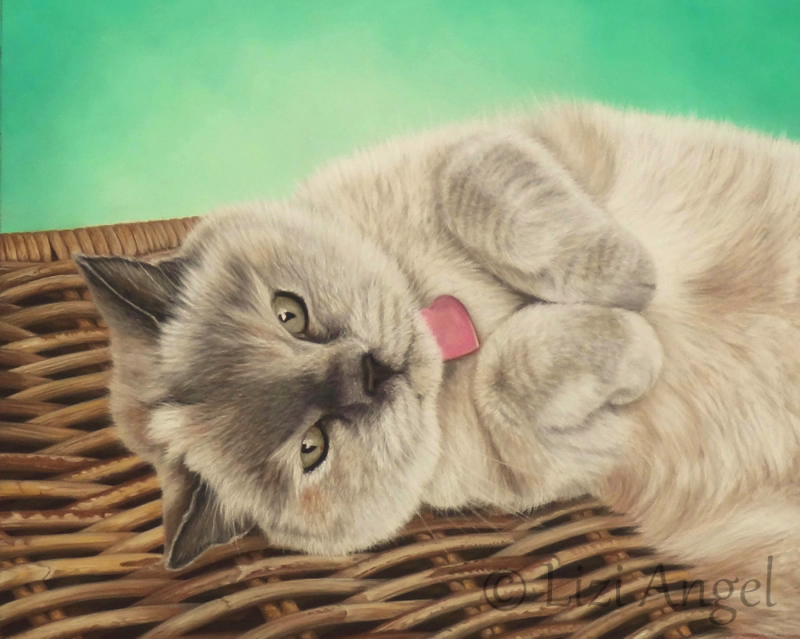 1131399). Visit GRWE's website to find out more about the wonderful work they do for these beautiful dogs. 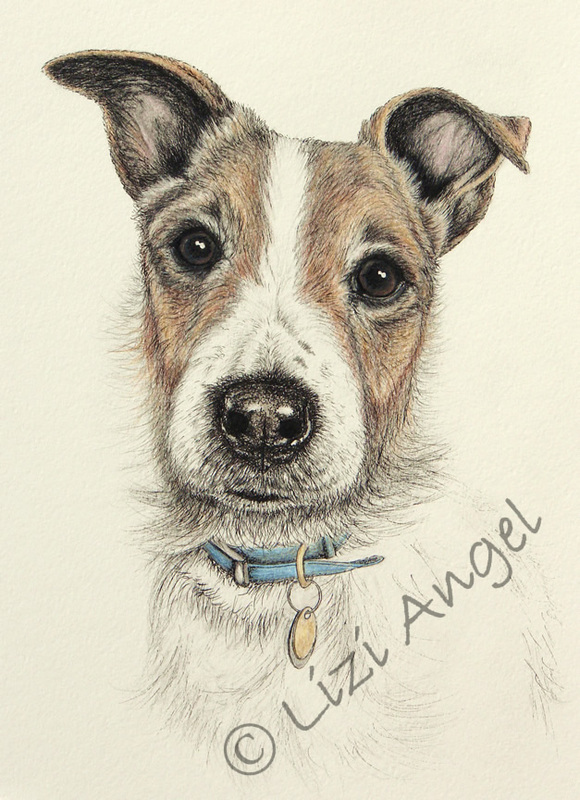 I donated a sketchy to the Grand Final winner of the 2013 Oldies Club 'Woof Factor' competition in March, and here it is (left) ~ well done to Parson Jack Russell Terrier, Baxter, and his foster carer, Kate! 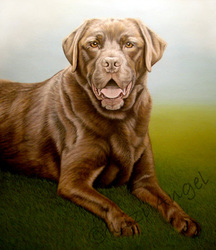 The competition was open to dogs aged 7 years or older. Full details about the competition can be found on Oldies Club's website. 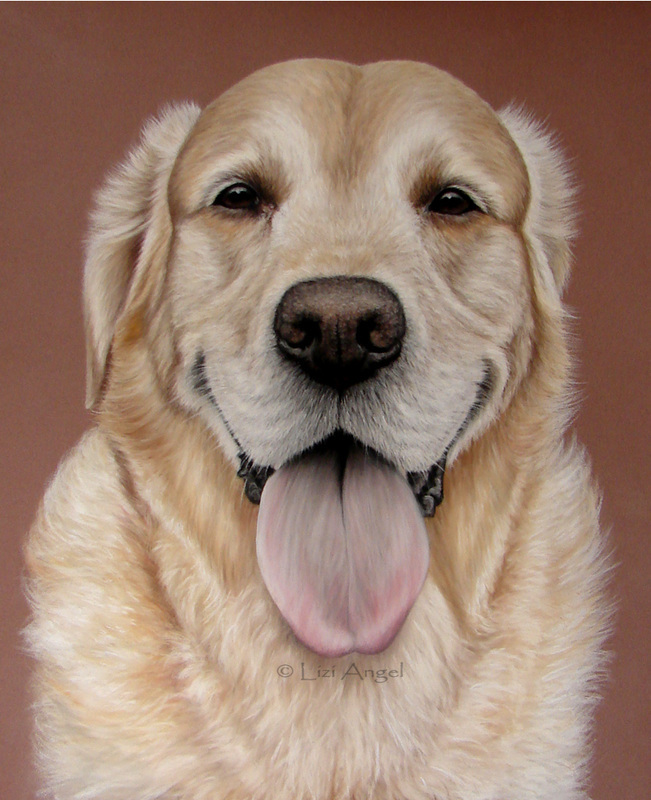 Oldies Club is a registered charity (number 1118246) that rescues and rehomes older dogs throughout the UK via a network of foster homes. 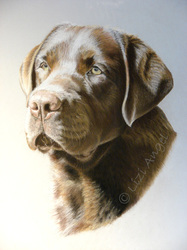 Please check back soon for details of future pet portrait auctions and competitions. 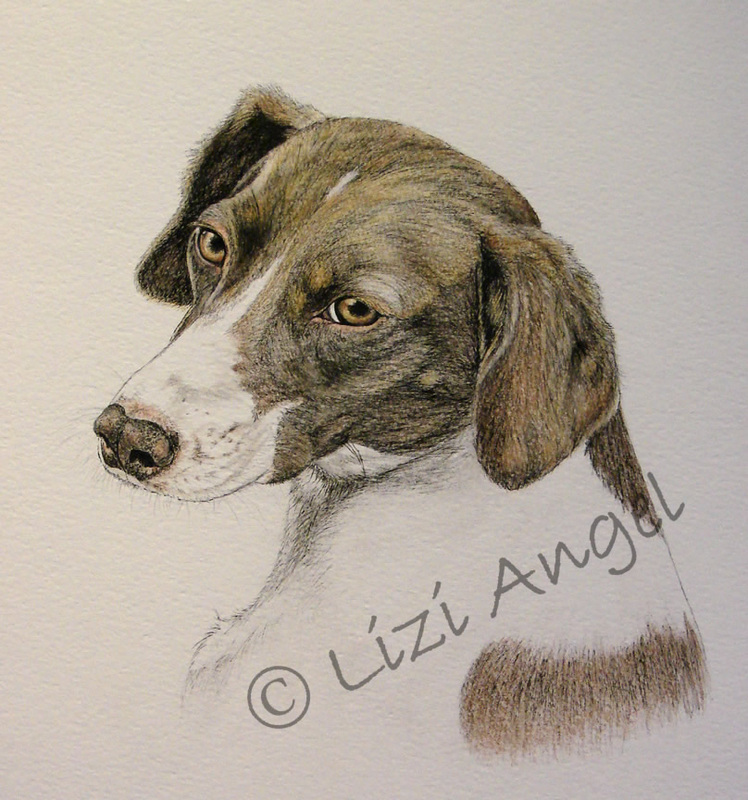 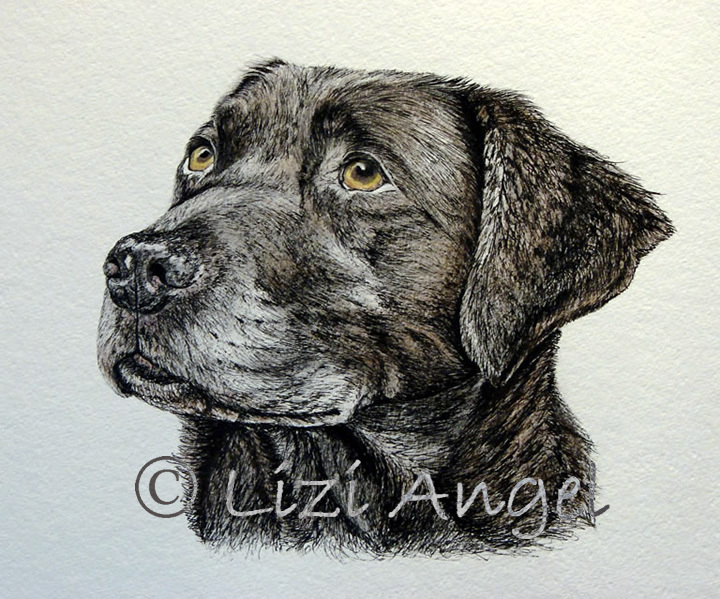 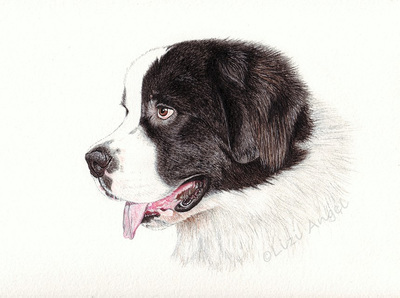 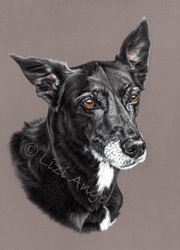 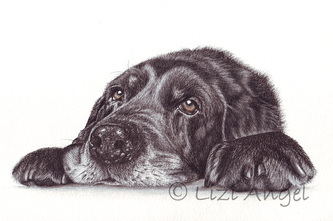 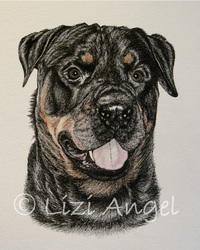 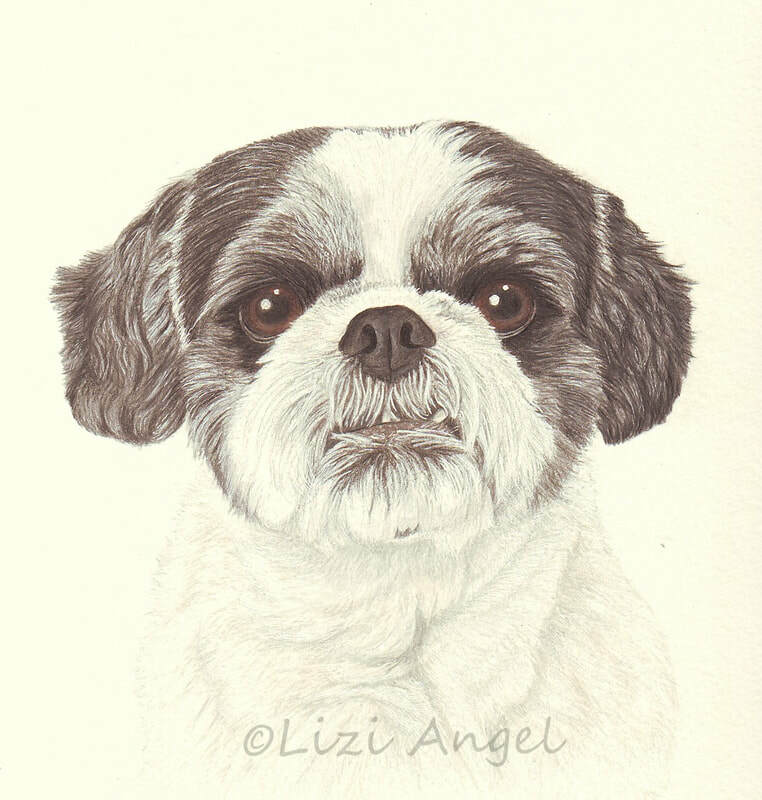 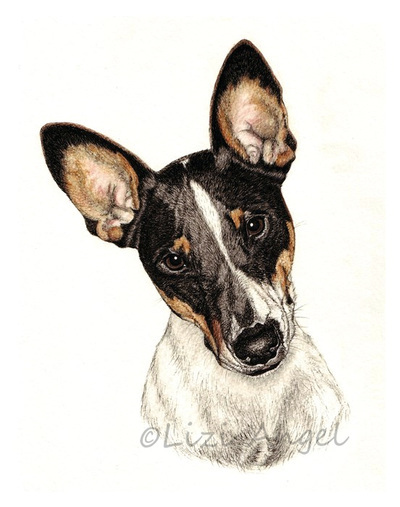 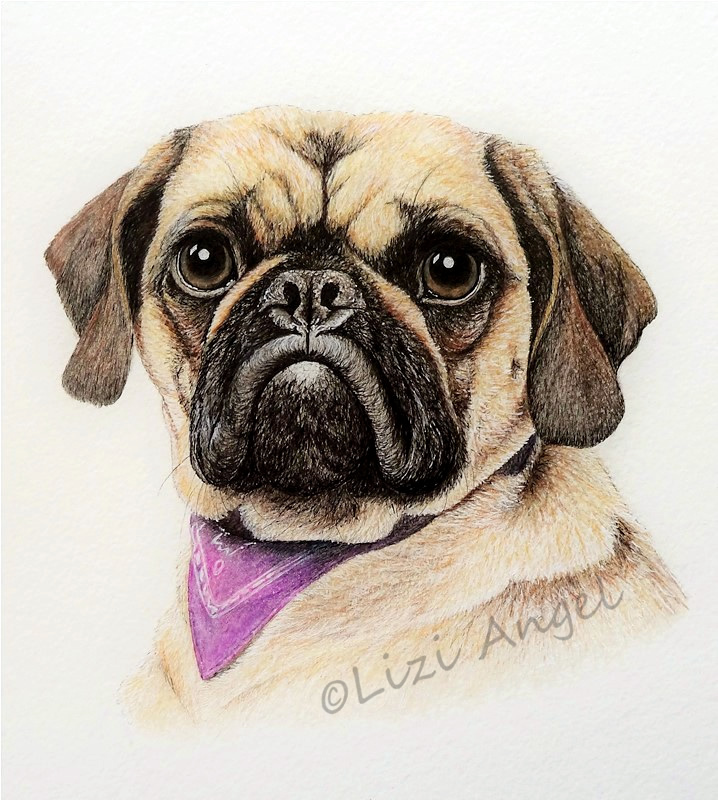 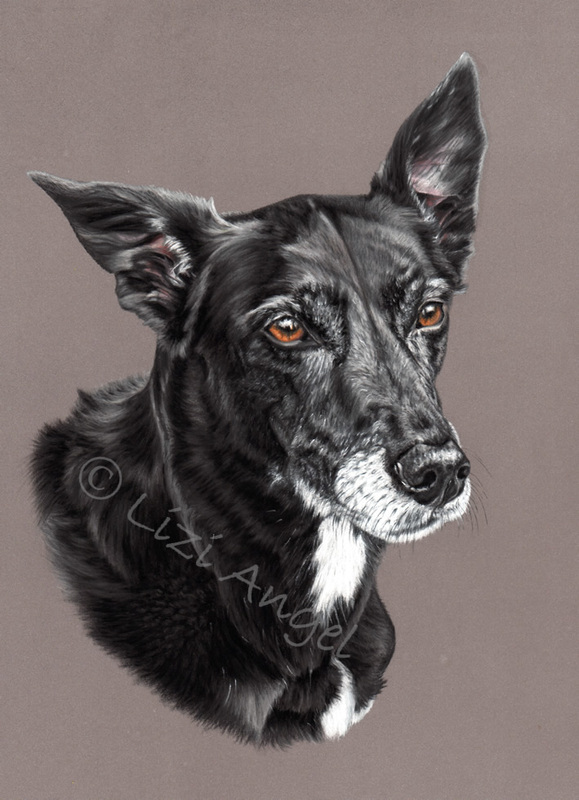 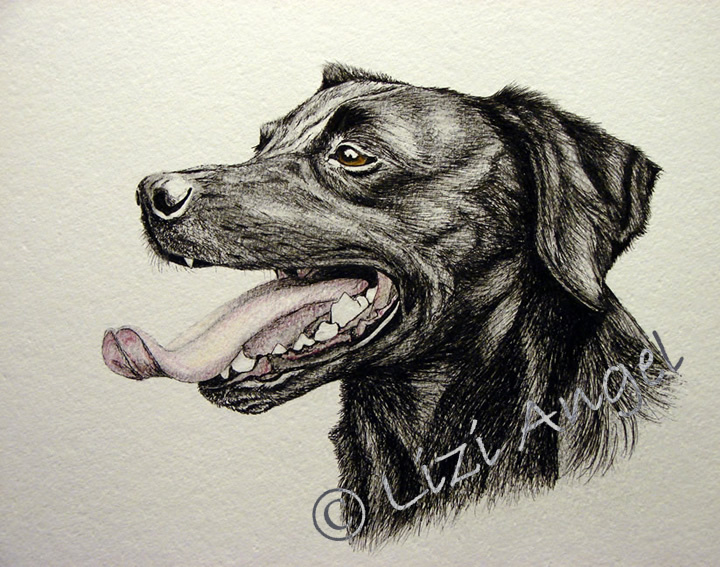 Last year, I donated a dog portrait to LRRSE's online autumn auction. The portrait was the auction's 'star LOT' and raised a fantastic £500! 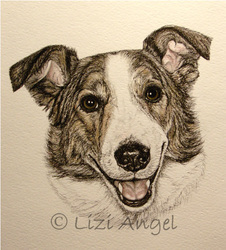 So this is Boz, who I painted for winning bidder, Anthea. The original LOT was for a head/shoulders portrait, but as Anthea's bid was so generous, it seemed only right to paint a larger, 3/4 body portrait of Boz, complete with background, for her instead. 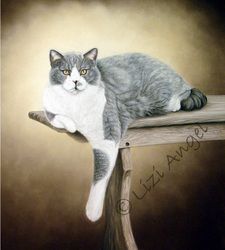 The painting measures approx 18" x 16". 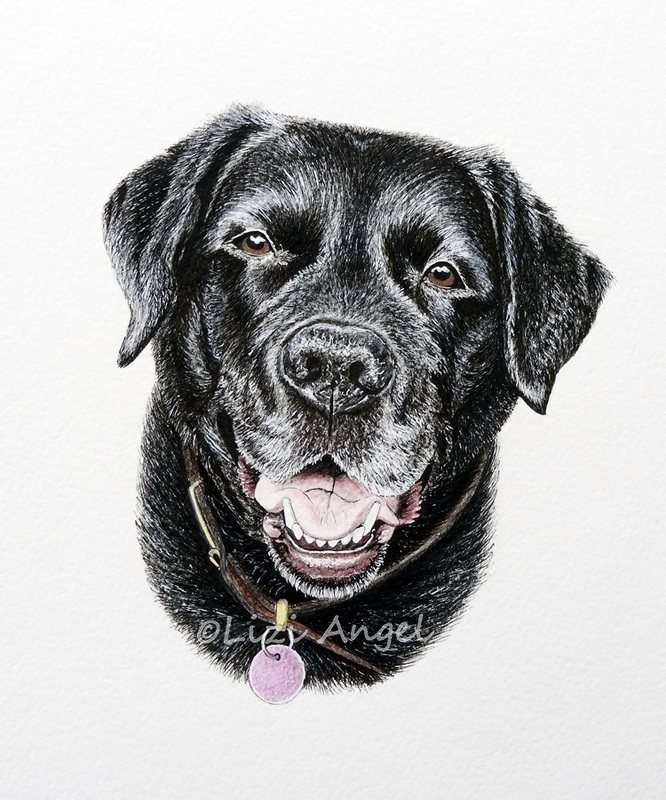 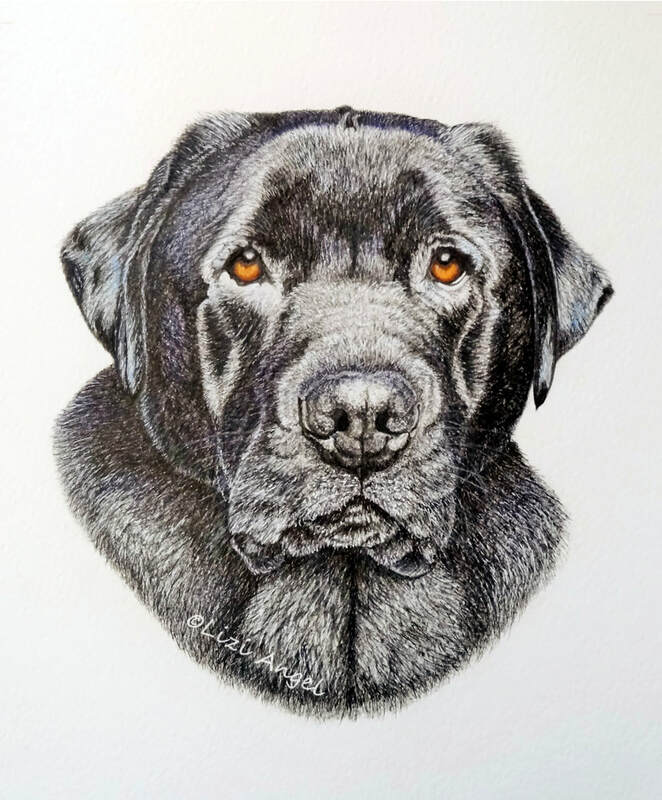 If you are a pet rescue or welfare charity who runs online auctions to raise much needed funds and would like me to donate a pet portrait, please get in touch with me via the contact form.